Whilst most market commentators were fixated on the prospects for further Fed tightening, the so called unwinding of easy money quantitative easing in the United States. The Japanese arm of the central banking crime syndicate took the markets by storm Friday by effectively decreeing that inflation is just too low for the systematic stealth theft of bank deposits to continue so now it's time to ramp things up a notch with the next step which is for NEGATIVE INTEREST RATES. The FIRST instance of which will be that an interest rate of -0.1% will be applied to bank deposits (excess reserves) with the central bank, again this is just the FIRST instance with MORE or rather WORSE to follow which sends a discouraging message to all against holding Yen deposits, triggering an immediate drop of over 2% in the value of the Yen. The primary reason why the Japanese government has gone negative on interest rates is to trigger PANIC consumption, to force bank customers to withdraw and SPEND their Yen or it will be stolen by the government and the rate at which it will be stolen will only worsen from -0.1% to -1%, to -5% to -10% all the way to -50% of remaining Yen bank balances! Whatever it takes will be DONE! YOU HAVE BEEN WARNED! Japan's move should not come as much of a shock for several European central banks have already been busy stealing bank deposits such as Switzerland's on -0.75% or ECB on -0.3%, so Japan given China's recent devaluations had no choice, and neither do the worlds other central banks for call it what you will i.e. the actions of a central banking crime syndicate or a currency war or a war on cash. For this is nothing new as I have been warning of the consequences of the WAR on CASH for several years now, as the central banks have each taken their respective steps along the path towards both PREVENTING future BANK RUNs (i.e. you can't withdraw your deposits as cash) and for triggering PANIC CONSUMPTION whenever the fiat currency system appears at risk of imploding into the deflationary death spiral that the perma bears have been blindly peddling as always being imminent forever! All whilst remaining consistently BLIND to the fact that the worlds central banks will always do what needs to be done to INFLATE! This begs the question, how can the likes of U.S. Fed further raise interest rates when other central banks are not only cutting but going negative? As this will just force the U.S. Dollar higher still. So is likely to act to dampen future Fed rate hikes for this year. 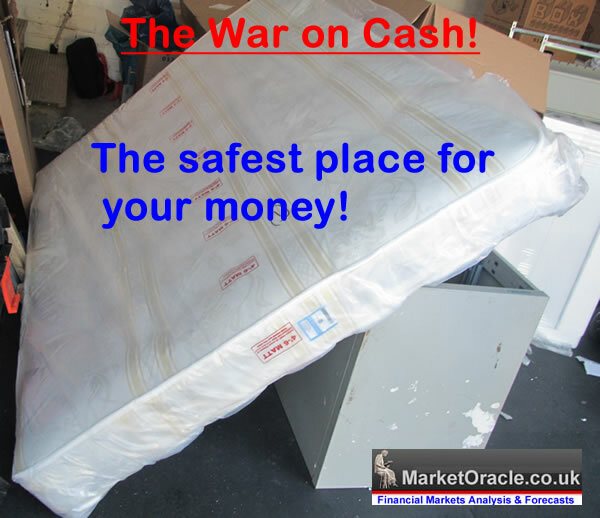 In the following comprehensive video I covered the Bank of England's War on Cash following it's September 2015 announcement aimed towards phasing out cash. 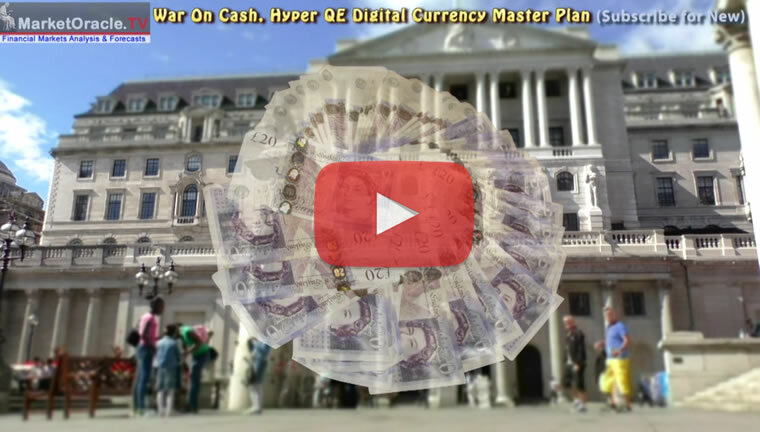 The Bank of England has taken the refugee crisis as a cue to accelerate the time table for targeting abolishing cash and therefore this video in the 'Illusion of Democracy and Freedom' series focuses upon the 'War on Cash', what it is, what it means and what it is trending towards and what all people need to do to protect themselves against the potential risks of not just theft of their hard earned life time of savings that in the future could be just a mouse click away from being legally stolen, but the risks of being financially deleted as western democracies are trending towards becoming financial totalitarian states. Do watch the video for it highlights several strategies to avoid the consequences of the war on cash. This IS THE MASTER plan of all governments, who via their central banks WILL seek to trigger PANIC CONSUMPTION through the mechanism of outright theft of bank deposits for which a very necessary step is the WAR on CASH so as to prevent the withdrawal of bank deposits as cash to be stuffed under mattresses both in response to negative interest rates and the next banking crisis bail ins. The consequences of the war on cash have remained consistent for several years now in that for savers to protect their wealth need to convert bank deposits into hard assets such as property, precious metals (opportune moment) and of course stock holdings (high volatility). Given my own portfolio breakdown which has remained pretty consistent now for near 4 years, my most favoured wealth protection asset class by far remains property holdings. Any opinions on gold mining stocks? They have been really trashed over the last couple of years and I think some of the P.M miners look a good punt. I've viewed this stock market sell off as a buying opportunity and Gold stocks do stand out. So yes, the sector looks appealing, now to figure out which stocks or just play it safe with the ETFs and other funds.